The French sheepdog Beauceron I have met many years ago, accidentally. Since that it began to be part of my life. Grande Satisfaction is dedicated this exceptional breed. 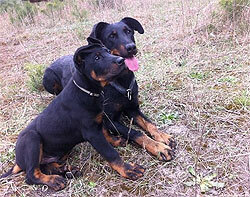 Brave and smart the “Grizzly Bear” – it is hard to find shorter definition of Beauceron. The dog which never lies, self-confident, resistant with strong passion for work. Its greatness and power of character create excellent conditions to ensure safety for its masters and property. The dog of one master. This sentence does not mean that Beauceron attaches just to one member of family. It does mean it is ready to jump into fire for its master. Barks little but wisely. It is characterized by the same features what a real man who says no more what is necessary. 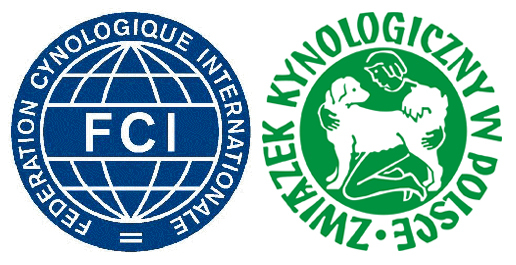 Kennel registered with the Kennel Club in Poland (ZKwP) , operating under the auspices of the FCI.